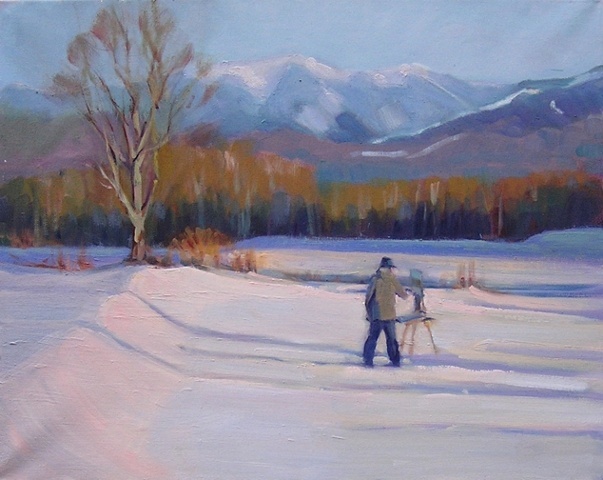 This is a painting I started at an amazing Workshop given by Stapleton Kearns in Sugar Hill New Hampshire in Feb. 2010. The figure is of one of my painting buddies, Dennis McQuillen. The workshop was called "Snow Camp" in which we painted outside in freezing temperatures for 3 days. It was a great way to find out how to keep hands, paints and, most particularly, feet usable in those conditions. To tell you the truth, for me the cold is not as bad an obstacle as either heavy rain or black flies... and getting to paint a snow landscape is worth it! I say that I "started" the painting at the workshop because I continued to work on this for quite a while after I got home using many ideas which were new for me about painting snow and about design invention in general. Thanks Stape!